The Rolnick Observatory makes use of a former radar tower built in conjunction with a local Nike missile base in the 1950s. "You ask the kids nowadays about the Nike site, they think it's a Main Street store," says Helen Garten. But the selectman and others hope to see the historical significance of Westport's Cold War-era missile base not only preserved, but celebrated if possible. In the mid-1950s Westport was selected as a site for Nike-Ajax missiles at what is now Bedford Middle School on North Avenue. Not far from that missile site, a companion radar facility at 180 Bayberry Lane, now the site of both the Rolnick Observatory and the Westport Weston Health District offices, was established by the U.S. Army. The two radar towers -- one of which the Westport Astronomical Society uses for the observatory -- remain intact at the Bayberry site. 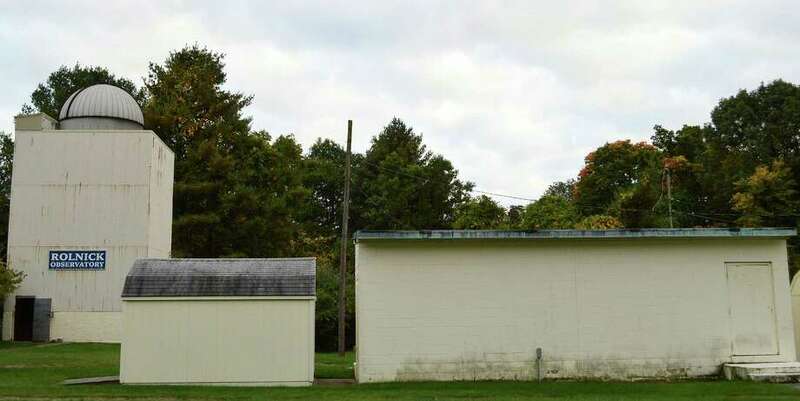 "These two towers are amazingly preserved," said Garten, who recently gave a presentation on the missile installations to the Historic District Commission on behalf of the astronomical society, which is spearheading an effort to preserve the site. "We have the two towers here and I don't think there's any other place in Connecticut where the two towers continue to exist." "The town owns the property and the Westport Astronomical Society leases the site and takes care of the facility," explained Kevin Green, a board member of the astronomy group. "Most of the focus is on the astronomical equipment, but the lawn is mowed, the trees are trimmed. The society does all of that." He and others, however, thought it was important for the town to retain what they believe is a historically significant asset. "I think that's what we'd like to see, if possible, is have someone independent come in and do an assessment, and then it's up to the town," Green said. Garten noted that the interior of the old barracks buildings on the property, which at one time were used for the Bayberry Kindergarten School, have been renovated many times, but the exteriors still roughly resemble their original design. "The barracks, I think, have been totally redone so many times," she said. "I don't think there's really anything worth looking at." She added, however, "No decision has been made about what the proper course of action is ... We need to learn a lot more about them." Green said that the focus could be primarily on preserving the towers. While the interior concrete of the towers is relatively unchanged, the sheet metal casings have become weather-worn and rusty. In her request to the commission to establish a study committee, Garten recounted some town residents' efforts to oppose the original missile installation. "There was a whole organization created to oppose it," she said. That history was documented in a fictional account written by Westport resident Max Shulman called "Rally 'Round the Flag, Boys." It later became a movie in 1958, starring Paul Newman and Joanne Woodward, who after filming in town decided to make Westport their permanent home. "The U.S. Army ... was worried about Soviet missiles, so they had to set up some sites to protect major installations," Garten said. "And Bridgeport was considered a major installation site" because of its defense industries. There were about a dozen missile bases throughout Connecticut, including one in Fairfield near the site of what is now the town landfill. "This was the radar site," Garten said of Westport's Bayberry location. "This was not the missiles ... The actual missiles were on the site of Staples (behind) Wakeman Farm." After the army closed the facility, the land ultimately fell under the auspices of the Board of Education, which after many years developed the new Bedford Middle School there. "These facilities originally were run by the U.S. Army and eventually it was turned over to the Connecticut National Guard to run," she said. A short time later, however, the missiles were deemed obsolete and the sites decommissioned. "They had a very short lifespan," Garten said. Since then, one of the two radar towers on Bayberry has remained unused, while the other became the housing for the observatory dome. "I'd like to know more about the history of it," Francis Henkels, commission chairman, said at the recent meeting. He said the observatory is a good example of effectively adapting one tower for a new use. Carol Leahy, HDC staff administrator, suggested officials might try to secure a grant to help research the site. "That's something to consider," she said, noting that it would be valuable to try and bring an objective observer in to compile a history of the site. The commission agreed and voted unanimously to form a committee to explore the issue. "I love it," said Commissioner Miryha Fantegrossi. "I think it's fantastic and I totally support it." Green said the project might also encourage more people to visit the observatory, which is open to the public every Wednesday night in good weather. "It's just marvelous what these guys are up to," Morley Boyd, former commission chairman, said of the astronomical society. "I wish more people in the town knew about it and maybe this is a little bit of a way to give a stage to what is a wonderful resource in our community."